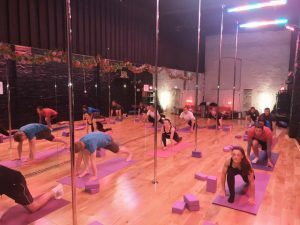 Corporate Wellness Fitness Services in Dublin | The friendliest pole dancing classes in Dublin City Centre! Looking for a different approach to fitness? We offer you the opportunity to show your staff that you care about their health and wellbeing with our unique fitness program for Corporate Wellness. Let our Corporate Wellness fitness classes transform your team and employees, not only in terms of physical wellbeing but also improved productivity, decreased stress and lower absenteeism! We’ve designed a fitness program that is suitable for all levels of fitness and includes: body-weight exercises gentle cardio to improve muscle tone and promote fat-loss, mobility exercises with dynamic flexibility to promote better posture, reduced stress and improved range of motion. Our instructors are experienced in working with a range of different levels of ability and fitness; we know how to adapt exercises to suit individual needs and ability. We do not believe in a “one size fits all” approach to fitness! Our program will educate your employees on how to live a healthier, more energetic lives, teaching them awareness of their own bodies and how they can improve their health and well-being between sessions. We know that not every business has full-fledged gym or dedicated fitness space, so for our classes all you’ll need are a few folks who are willing to set aside a few minutes to look after their fitness and a little bit of space – we’ll look after the rest. Interested to get the ball rolling and helping your employees take their fitness to the next level? Contact us below! 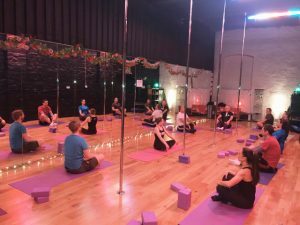 I recently attended a corporate flexibility and mobility class held by Arlene of Irish Pole Dance Academy. It was a fantastic class, conducted in a fun environment and everyone who attended it found it extremely beneficial. Arlene is a thorough professional and an excellent instructor. She brings a vibrant mix of technical knowledge and fun and I would have no hesitation in recommending her services on a personal and corporate level. It is evident to see how beneficial Arlene’s services would be to any corporate wellness program that your company might offer. Her classes are extremely enjoyable and you learn so much about yourself and how to take care of your body better.